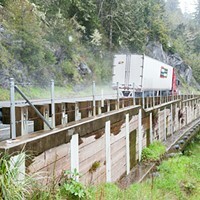 A tractor trailer passes one of the retaining walls on the grade. The California Transportation Commission has allocated $5 million to fund the environmental and geotechnical studies needed to build an alternative route around Last Chance Grade, the long-failing portion of U.S. Highway 101 just south of Crescent City. The offices of Congressman Jared Huffman and state Sen. Mike McGuire announced the development today, the first step in what is expected to be a lengthy planning and construction process that currently has an estimated completion date of 2039. “I thank the California Transportation Commission for recognizing the importance of finding a long-term and durable solution for Last Chance Grade and for providing the much-needed support to move this process forward,” Huffman states in the release. 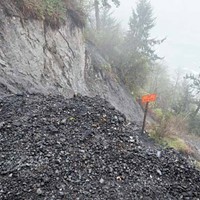 The 3-mile stretch of highway, which has shifted 50 feet since 1937, has been plagued by landslides since the first wagon road was cut there more than 120 years ago. “Due in part to the support of the community, lawmakers, and stakeholder groups, Caltrans is now a step closer in the development of a long-term solution at Last Chance Grade,” Caltrans District 1 Director Matt Brady states in the announcement from Huffman’s office. There are currently six proposed alternative routes for the vital link between Crescent City and points south, with price tags ranging from $300 million to $1 billion. Each one comes with its own set of major obstacles, including old growth redwoods, challenging terrain and sites of cultural significance to local tribes. 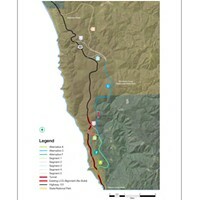 Read previous North Coast Journal coverage of the challenges facing the project here and here. WASHINGTON, D.C. — Congressman Jared Huffman (D-San Rafael) today announced that the California Transportation Commission (CTC) has awarded $5 million in funding for Last Chance Grade, the slide-prone stretch of U.S. Highway 101 between Klamath and Crescent City. Earlier this month, Rep. Huffman was joined by Assemblyman Jim Wood and Senator Mike McGuire in sending a letter to the CTC supporting Caltrans’ request for funding. This letter was accompanied by dozens of additional support letters from local governments, tribes, environmental groups, landowners, businesses and transportation interests who rely on the integrity of this stretch of the highway. 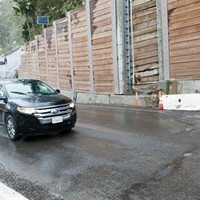 The funding will allow Caltrans to begin conducting the necessary environmental and geotechnical investigations of potential alignments of the highway around Last Chance Grade. This is a critical step to protecting the safety and economy of Del Norte County and the people and commerce that travel U.S. Highway 101. Sacramento, CA – The California Transportation Commission voted today to approve $5 million for initial environmental work related to the permanent solution for Last Chance Grade. Senator McGuire, Assemblymember Wood and Congressman Huffman have been fighting for these funds for the past many months. Assemblymember Wood, Senator McGuire and Congressman Huffman have been working closely with Del Norte County Supervisors, Crescent City leaders and state transportation officials, and earlier this year hosted on-site meetings at the Last Chance Grade after portions of the highway collapsed, closing and damaging the road. 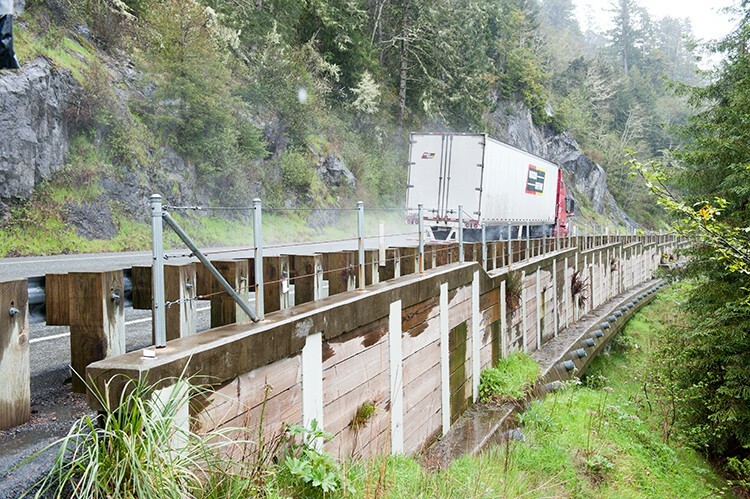 “It’s unacceptable that it has taken decades to get Del Norte County residents a safe and reliable highway, and it’s our top priority to get this permanent solution moving,” Senator McGuire said.